Like my hair? My eyes? Iplehouse Tania, or Mercy... the same doll. 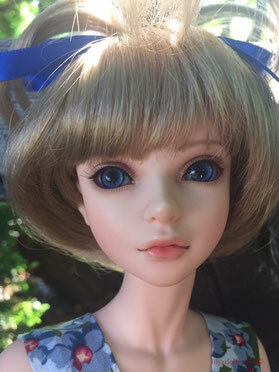 Mercy usually wears this Monique Rose wig that I chose for her before she arrived. I love her in this hair, although it's not easy to photograph her face with all the curly wisps. I love wigs that are soft and touchable...I like to pet a doll's head, like a friendly cat. 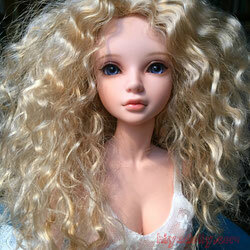 This is a pretty bjd wig that has been in use on several of my dolls, that thankfully wear the same size. This is a sort of sweet punk look. Mercy has also had her eyes changed, from brown, to blue, to hazel, to gold. This is a wig that is hardly ever worn by any of the dollies, with its fountain top... except for fun. I put Mercy in a baby doll dress to go with this wig, for a photo shoot. This soft red shag wig has also been used on several dolls (including the boys when they were wigless). When I put this on Mercy it was a relief for a while because it is so smooth and simple, and wasn't always getting in the way. I love this Monique Bubbles wig. I have several and it is the "forever" wig for 3 of my dolls now. Just temporary on Mercy though... She had to give it back.